Krabi Travel Guide | Southern Thailand's Best Kept Secret! Krabi Travel Guide | Southern Thailand’s Best Kept Secret! Home » Krabi Travel Guide | Southern Thailand’s Best Kept Secret! The sheer volume of beach destinations and seafood restaurants make Krabi travel guide one of the most sought-after travel itineraries for all beach enthusiasts. 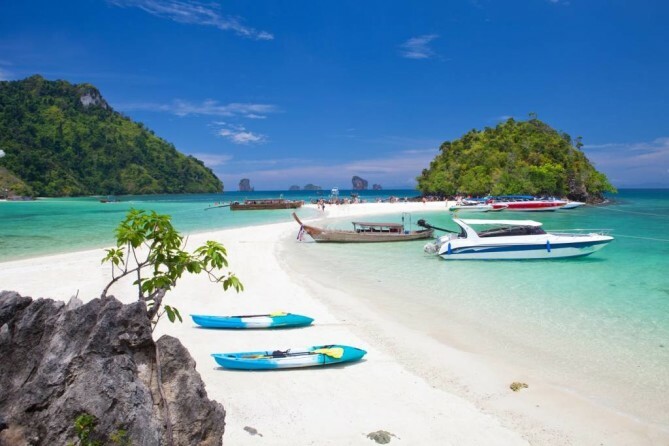 On the West Coast of Thailand in a similar angle of Phuket, Krabi lives up to World’s standard among those in the know searching for beach vacation by characterizing Unseen Thailand Separated Sea (Talay Waek), diverse aquatic life, vivid coral reefs and a moment to drift in lazy spiral. Krabi is at the same time haven and heaven for island hopping but less developed and crowded than Phuket, more relaxed than Samui. For first-time and regular visitors alike, switching to visit Krabi Town to get to know Thai provincial town can be done so easily before getting on the boat to travel the islands. Things to do in Krabi, outside of enjoying sea sand sun, can be as diverse as a list of seafood restaurants, shopping venues, buddhist temples, nightlife areas with great live music. 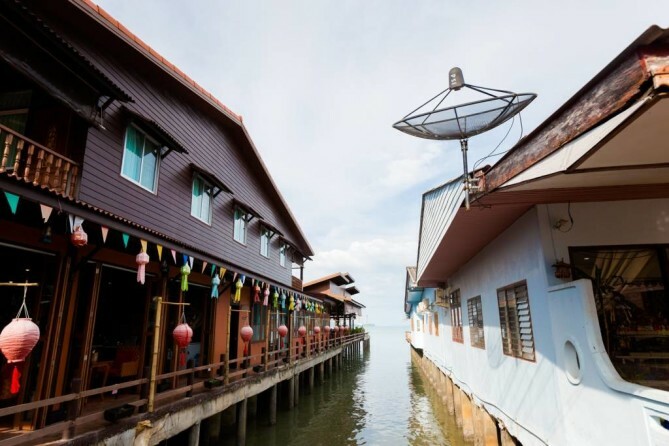 Quite similar to Hat Yai, Krabi is rich in cultural diversity that belong to the local Buddhists, Muslims and ‘Chao-Lay’ or sea gypsies who harmoniously live under the same city’s sky. 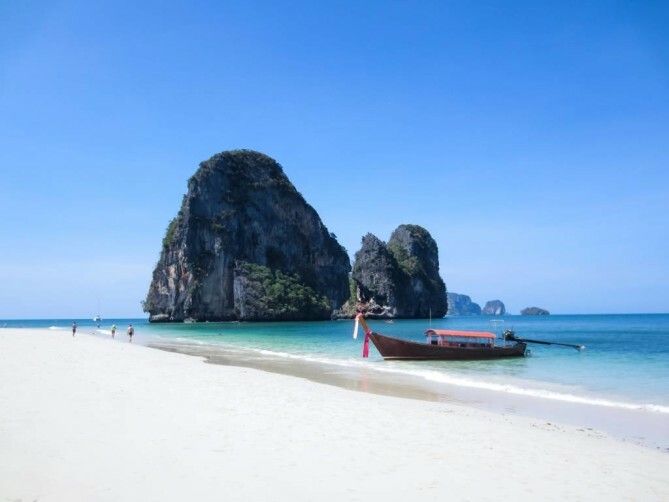 Follow this Krabi travel guide to follow in Leonardo DiCaprio’s footsteps for Phi Phi Islands trip, where the famous movie ‘The Beach’ was filmed. 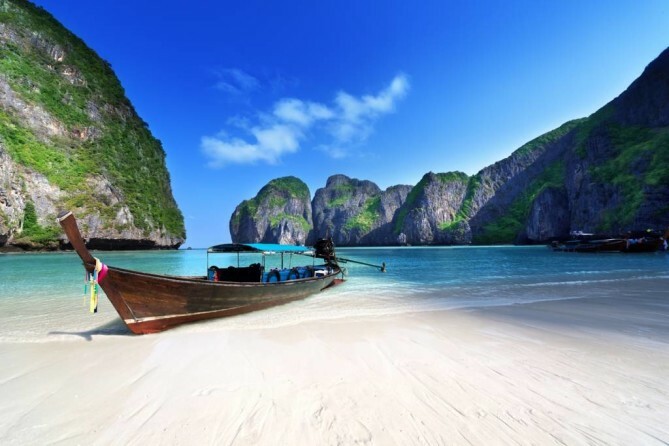 Further than the movie, Phi Phi islands is one of the places to visit in Krabi and is a reason itself why globetrotters must set foot in this beach destination among the many of South Andaman Sea. Embarking on a 45-minute speedboat ride from either Krabi or Phuket, Phi Phi island defines the ultimate tropical getaway Thailand has to offer. Phi Phi islands are composed of six islets with two main well-known touristy spots: Phi Phi Don and Phi Phi Leh. The largest of its kind, Phi Phi Don, features a wide selection of accommodations as it’s the only islet apart from the rest that allows for permanent residents, whereas the smaller Phi Phi Leh is uninhabited islet and is home to the location where the movie was filmed, Maya Bay, a sheltered area with 100-meter-high cliffs surrounding on its three sides. This Krabi travel guide will not complete without including the true star of the the show. A sandbank bridge that leads to the unspoiled three islets: Koh Tub, Koh Moh and Koh Kai, is called Separated Sea (known in Thai as ‘Thalay Wak’), Unseen Krabi Thailand. The popularity among beach bums can be said that some first-time travelers get to know this even before they’ve landed the city. 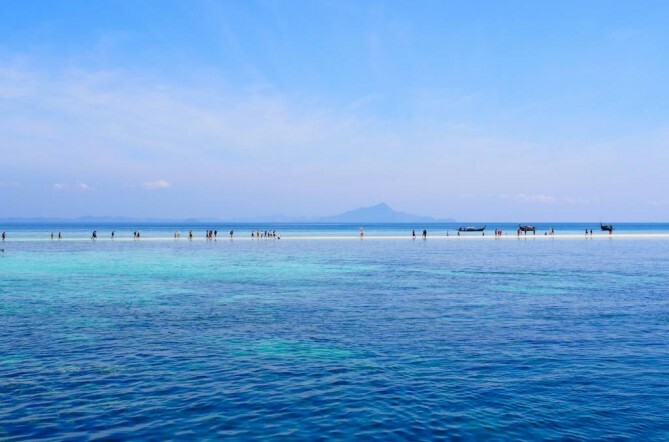 The amazing phenomenon of Thale Wak happens at low tide when the water level is down and the dunes gradually appear miraculously and connect the three islets through the sand bar. 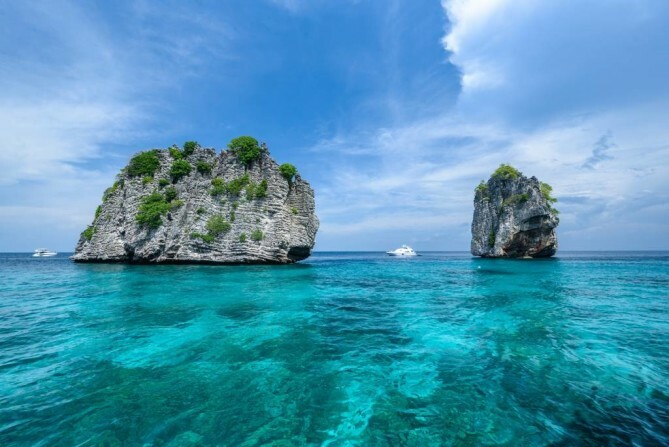 Such natural spectacle offers some of special things to do in Krabi. Some of which are walking along the sandbank bridge and taking in the sight of spellbinding vista of emerald waters under clear blue sky. Others are simply having a good time by venturing into the water to engage in sports such as paddle boarding, swimming, snorkeling or simply getting skin tanned by sunbathing, people watching. Sitting on the beach and doing nothing is even possible. The Separated Sea Krabi is best visited during 5 days before and after the full moon between December to the beginning of May. Having once reached the peak of Ngorn Nak Mountain, the conquerors couldn’t agree more that the climb is well worth the effort. 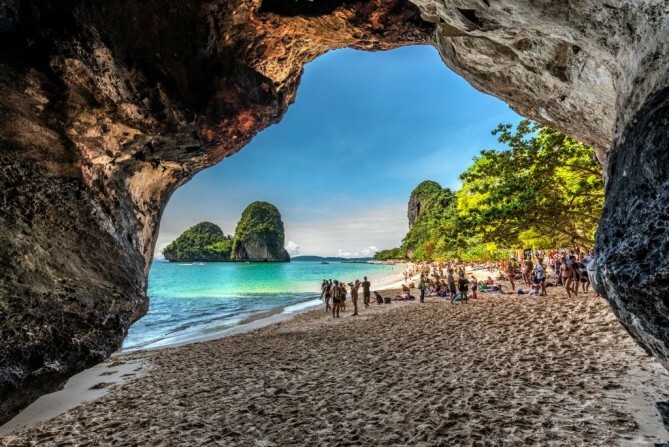 This Krabi Travel Guide is introducing you to the famous ‘Railay Beach’ as one of Thailand’s most crowd-pleasing hideaways and is one of amazing places to visit in Krabi. Its towering limestone cliffs with sheer faces and imposing overhangs, altogether give credit to Railay Beach a well-known destination for rock climbing. The landscape around Railay Beach are all that never-ending beauty of Krabi paradise. Secluded from the mainland, Railay Beach is sheltered among the warm Andaman Sea with lush jungle which is home to some interesting things to do in Krabi like jungle treks and elephant trekking. Apart from this list, all islanders can enjoy sea kayaking, desert island stay, exploring the island and Phra Nang Cave, cooking class at outdoor kitchen and Thai massage, of course. 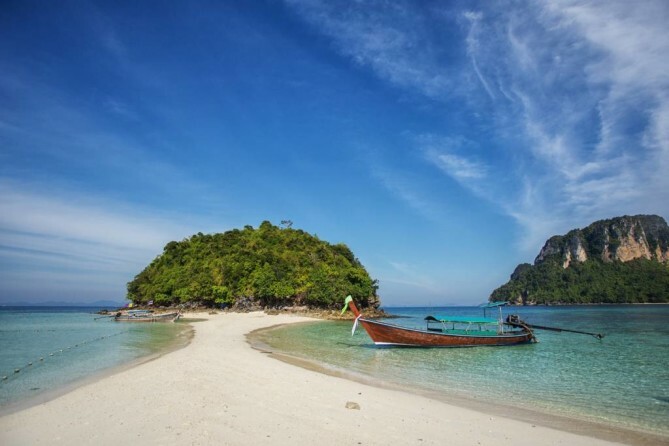 Because of all of these, Railay beach draws in number of tourists each year and it caters to all requests to those seeking for adventures or laid-back environment to wind down. 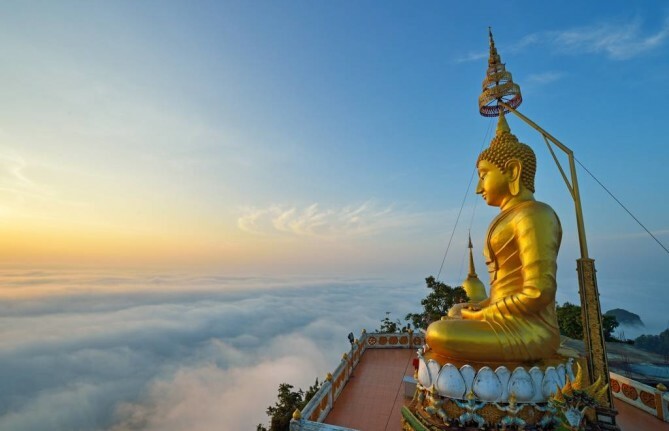 The picture-perfect location of Wat Tham Sua (Tiger Cave Temple) may mislead you to assume that it is located in a faraway land. But stay for awhile and you’ll find out that it is only 3 kilometers from Krabi town, making it one of the places to visit in Krabi within the city radius. Wat Tham Sua is known for ‘Tiger Cave’ as its alternate name implied the fact that tiger paw is being found printed in the stone inside the cave. For this, Wat Tham Sua must doubtlessly be talked about in this Krabi travel guide. 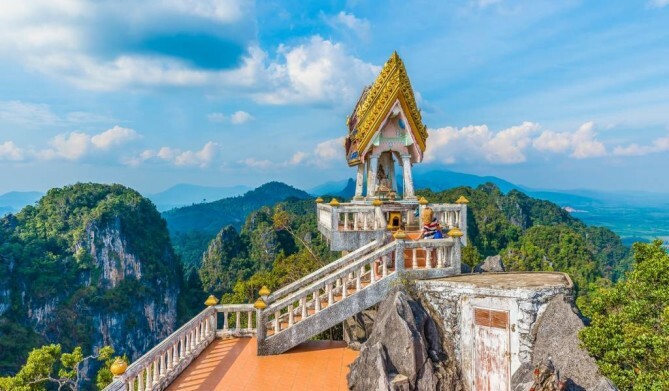 After climbing 1,237 steps to reach the top, Wat Tham Sua appears to be another great viewing spot overlooking Krabi town with the gilded seated Big Buddha statue atop. Under the blazing sun, which is typical for Southeast Asia’s climate, the temple is cooled down by a group of large trees over centuries old thanks to its location that is nestled among mountains on all sides. Aside from the outdoor area to astonish, Wat Tham Sua is of archaeological significance and historical interest for stone equipment, pottery leavings and the mold for making Buddha footprints which have been found in excavation. 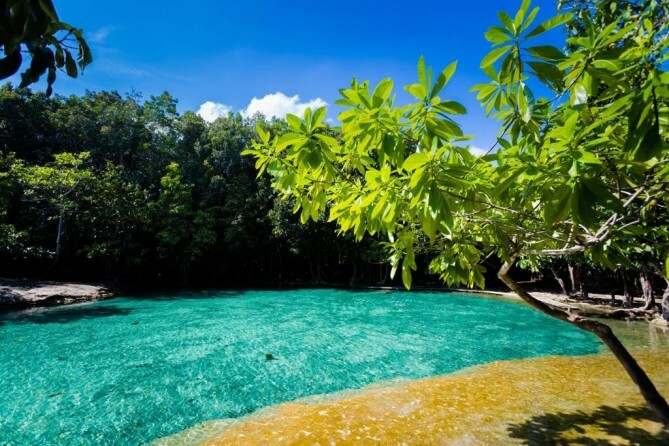 The Emerald Pool has always been part of any Krabi travel guide, we’d say. This well-liked tourist attraction is in favor of not just foreign visitors, but the Thai people as well. Spending time on a 45-minute ride from Krabi Airport is surely worth the wait. Emerald water lined with lush jungle suitable for a perfect swim, a picturesque description one can imagine to behold when witnessing Krabi Emerald Pool. Owing to its spectacular colors, which changed in accordance with light condition and duration, the pool can be anything from crystal clear to deep green. The Emerald Pool in other words is a complete natural hot-tub jacuzzi. Derived freshwater from the upper hill sources, the Emerald Pool supplies with cool water to cool down the heat and refresh the day. 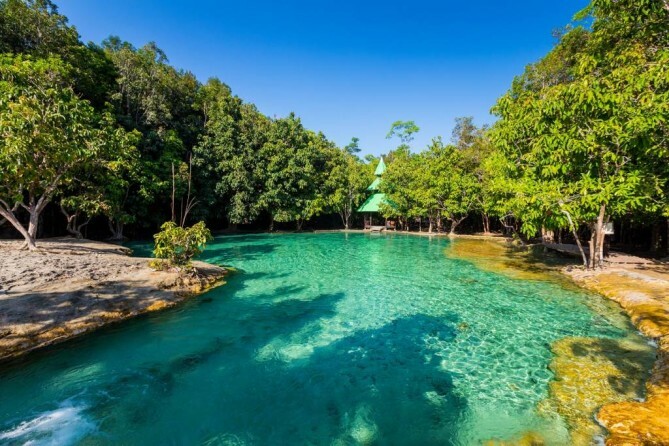 Dipping in the Emerald Pool is one of the things to do in Krabi which can be acquired after nature trekking through the beautiful Khao Pra-Bang Khram Wildlife Reserve Sanctuary. For nature lovers and bird watchers, let’s say hello to the rare black-breasted Pitta bird and do not skip the best part by exploring all of its beauties! In this Krabi travel guide, a good vacation doesn’t necessarily start with partying all night long. As Koh Lanta stays true to itself with a tranquil concept avoiding from all of chaos. 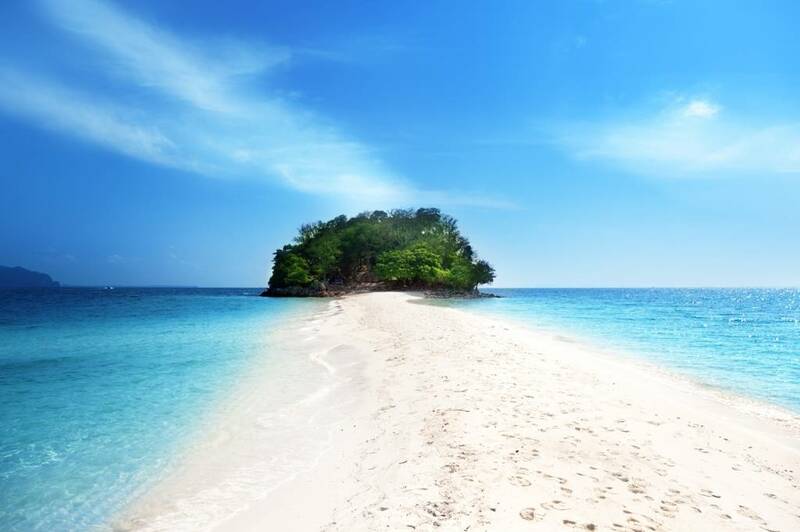 Those who have penchant to stay away from highly popular tourist attraction among Krabi’s and Phuket’s hidden gems, Koh Lanta is your best bet. 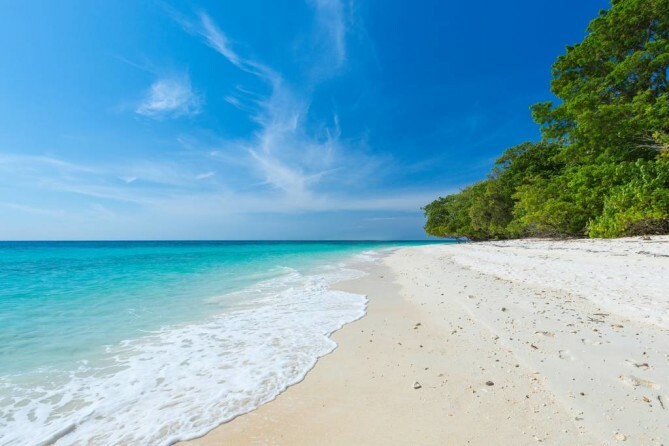 Located in a remote area of 70 kilometers off the coast of Krabi, Koh Lanta as a result is home to pristine beaches, unpolluted atmosphere and exuberant marine life and fringing coral reefs. Owing to all that natural wonders, Koh Lanta adds up a list of things to do in Krabi without question. A list goes on lazing on sun-kissed beaches, exploring Koh Lanta National Park, island hopping on the 4 islands boat tour, go scuba diving, snorkeling and kayaking, strolling around Koh Lanta Old Town. Regardless of those list, doing nothing is what Asian, European or Scandinavian travelers are allowed to do just that. 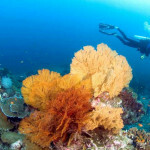 Koh Lanta is best visited during tourist season which runs from October to April. Book your flight to Krabi today! 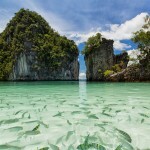 Visit http://www.bangkokair.com/eng/flightdeals/view/krabi to check flight availability.